If you’re a Kudos distributed record label, then you will be able to take full advantage of our recent new development; K-Shops. If you haven’t set yours up yet, please get in contact with your label manager. 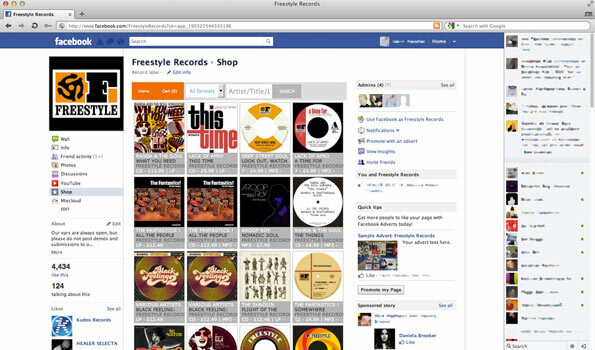 It’s incredibly easy to integrate your K-Shop with your existing websites and Facebook fan-pages. No need to be an expert with html, php and css, it’s simply a case of selecting a few options and then copying and pasting some text! The first thing you’ll want to do is personalise the look and feel of your K-Shop. 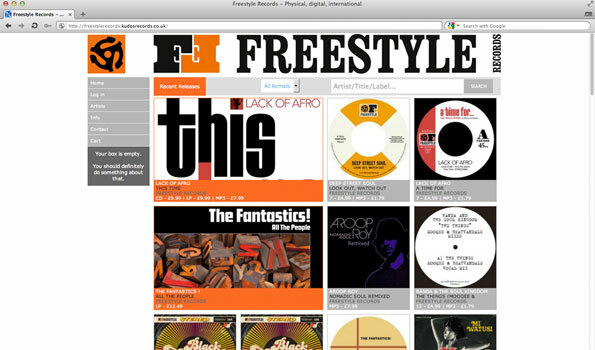 If you look at the example below, you’ll see that Freestyle Records have inserted their own header graphic by uploading theirs via the admin panel, and they’ve customised the colours of the various elements to match their own branding. As standard, your K-Shop will list releases chronologically, but there are options within the admin panel to very easily display your preferred releases within the main feature boxes, if you so wish. 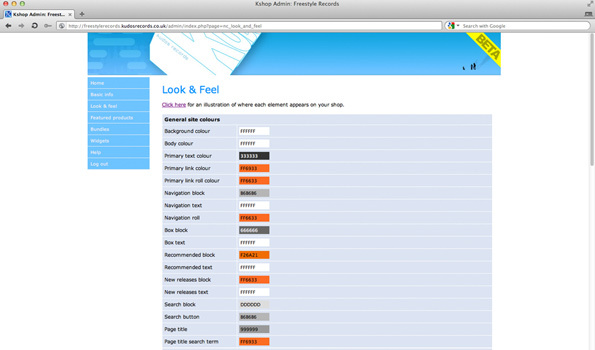 It’s also possible to create a second tab (beyond the initial ‘Recent Releases’) to display recommended releases – again, all customisable via the admin panel. Here’s a visual example of just how you can customise the colours within your K-Shop – also note that there’s a link at the top of this section to a visual depiction of exactly what is what. To embed your K-Shop, or a specific release, within a webpage all you need to do is create a new widget within the admin panel. Once you have specified what you would like your widget to display (using catalogue numbers) and entered the width of your widget, plus other options, it will then generate iframe code for you to paste into your webpages. This iframe code can be pasted into any webpage that accepts iframe (of which the majority do). Your page will then depict the code beautifully! 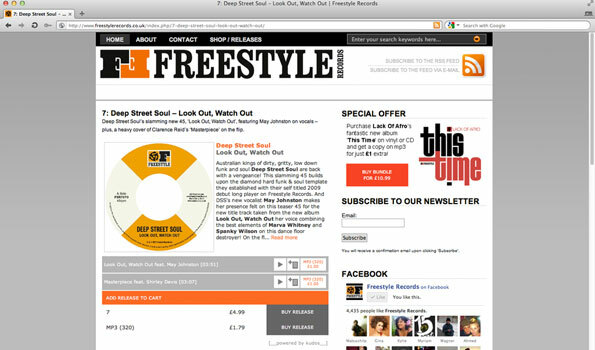 See the example of a single release widget embedded into a blog post on the Freestyle Records website below. 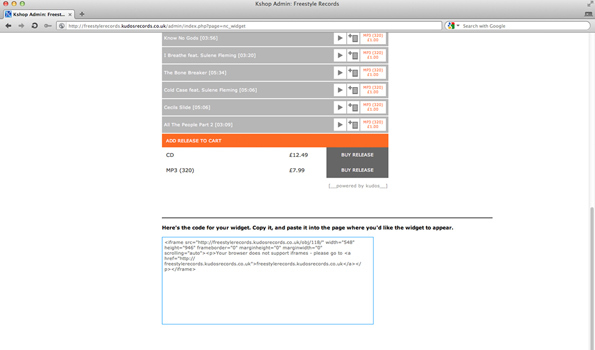 As you can see, it displays artwork, sales notes, tracklisting (with playable snippets) and buy links/shopping basket features. 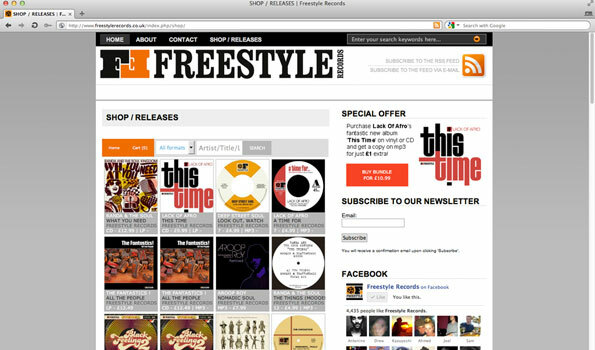 Freestyle Records have opted to create a shop page on their website in which they have simply embedded the widget iframe code to display all of their releases. This displays in a very similar vein to how you see your releases in your actual K-Shop. You can customise how many releases display on a row and the widget will resize them based on the overall width you have entered. 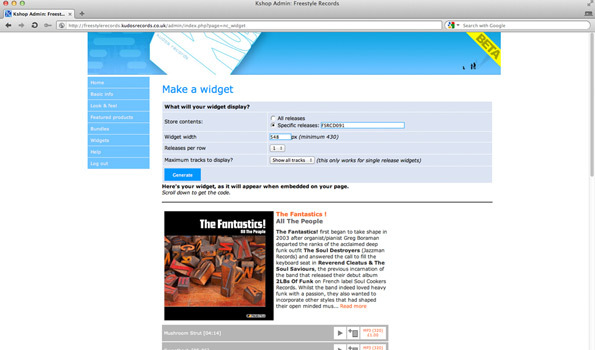 Incorporating K-Shop widgets into your websites will save you a lot of time and hassle. It very neatly (and attractively!) displays your releases and includes artwork, sales notes and audio clips. Not to mention that it’s a very slick way to sell your releases directly to your fans. But, one other thing KShop widgets have above other alternatives is that it actually looks like part of your own website, and not just some awkward piece of embeddable media. It can seamlessly replace any need for you to create an online shop yourself, or waste hours manually adding all of your releases and their respective audio clips and buy links. K-Shops and their embeddable widgets are attractive, functional and extremely easy to use! Incorporating your K-Shop into your Facebook fan-page is a very similar process. You generate the widget iframe code in exactly the same way, but be sure to honour the restrictions that Facebook fan-pages present – i.e. the maximum width is 520px. 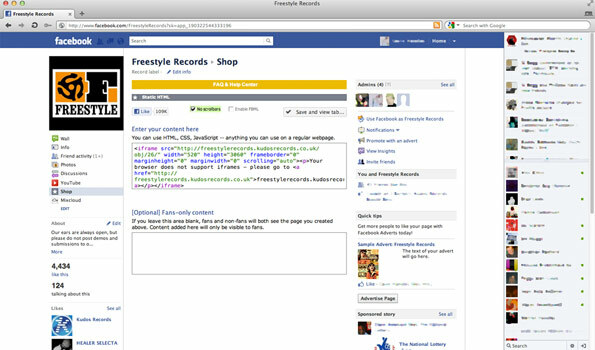 Once you’ve generated the code you can paste it into an iframe tab within your Facebook fan-page. Once you’ve pasted the widget iframe code and saved your tab, it should display your releases just as beautifully as it does on any other webpage.